I'm going to do something extraordinarily old womanish (fits with the theme of feeling elderly and crotchety) and blog about my cat. When she is a roll on her back, snuggle up to you to sniff your nostrils, little baby of love, she is Maudie. When she is a howl at the bug on the ceiling, wish she could sleep in the bed, why won't the lamps play with her sad little muffinhead, she's Maudlin. When she is something to be avoided, in a keep the door closed, watch that water glass, don't leave that breakable thing lying there demonic thing, she is A Certain Cat. When she's charging about the place attacking door jambs and sounding like she's a tiger, she's The Kit-ten. When she's just fine but we're bored, she's Maudie, Maudie, Maud, Maud, Maud, Maud, Maudie (sung to the tune of Bobby Baby, from Company). The question may be asked--why are you talking about your cat? Did you really think anybody would care about somebody else's cat? Well, to the second question, I suppose not, but it's my blog and I love her and everybody else who lives with me gets talked about and she feels left out. Or I anthropomorphize her into feeling left out. 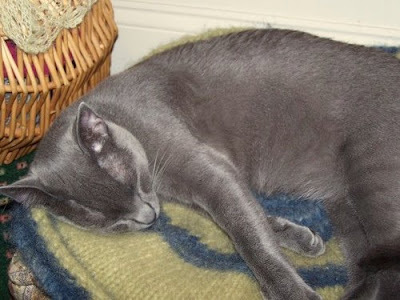 To the first question, I thought, perhaps erroneously, that somebody might wonder who that cat is in all those photographs that appear on the blog. For she does really insert herself into everything, doesn't she? I mean, she was here. And here. And here and even here. It's like playing Where's Waldo. That's me attempting to document Rivendell. See that paw? It just can't help itself. I bought this yarn, Pine Woods Yarn Wool/Nylon Sock, at the same time I bought the Aurora Acquerello for Spina di Pesce, and thus I will always think of these two yarns and these two socks together and compare them. Aurora, obviously, would not do well compared with just about any yarn (still mad about it, sorry), but the Pine Woods really is a standout--in the other direction. So. Soft. It feels almost like cotton, but a gentle, stretchy cotton--I mean only that it feels very clean. Think Egyption cotton flour sack. It was a joy to knit with. The pattern--not so much. I think it's my own stupidity, but I could not quite get my head around the wrapped stitch cuff thing, and while it looks right, it doesn't feel quite right for me. I knit them while we were in Hawaii over Christmas, and caught my mom admiring them, and since I've decided the cuff bothers me, I think I'm going to bequeath them to her for her birthday. 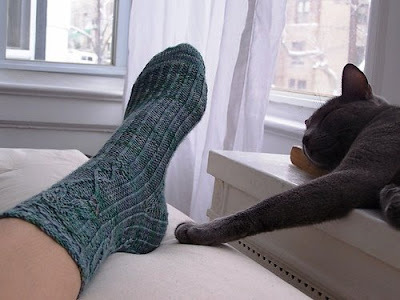 She got some rather scratchy socks a few years ago, before I'd really ventured into the world of sock yarn, and she really ought to give these a feel. And the colors are so very Volcano-y. The cat doesn't come with them, though. For more Ou est le chat?, click here, here, and rather obviously (guess I've done this before, but the love is strong you know), here.